Swipe Telecom India Private Limited gave its entry into the gadget market six years ago. Since then they have been manufacturing smartphones and tablets and satisfying its customers needs. It is exclusively an Indian company which also operates in Singapore and the US, it often comes up with upgraded gadgets with upgraded technologies. In this post let us particularly talk about tablets, tablets were very popular initially when they were released and then its craze gradually decelerated. But Swipe has been consistent in manufacturing the best tablets with great features while integrating them with the latest trends and technologies. Till now the company has manufactured six tablets. 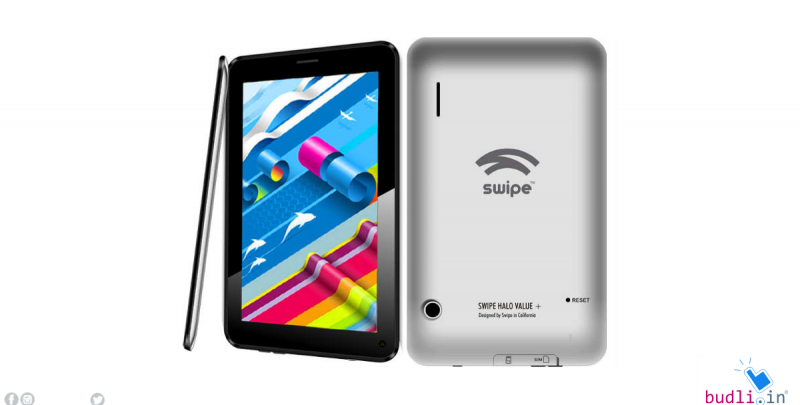 In this post let us see Swipe tablets at a low price in India. Before that let us just see what Swipe tablets have to offer us. The device has a 25.6 cm (10.1) HD IPS screen which allows you to view great clarity videos and photos. To take great photos it has a 5 MP rear camera and a 2 MP Selfie camera. It can multitask without any lag as it has been integrated with the 1.1 GHz quad-core processor and has 2 GB RAM and 16 GB ROM which is quite good. It is powered by a massive 5000mAh battery and the tab runs on Android Marshmallow. With Strike 4G you can enjoy a 7 inch HD IPS display which enhances entertainment. You can run high graphics apps on this device as it has a 1.3 GHz quad-core processor with a 2GB RAM. It has an internal storage capacity of 16 GB and can be extended up to 32 GB. It has a 5MP rear camera and a 2 MP front camera to click pictures at one strike. It has a powerful 3000mAh battery and runs on Android Marshmallow 6.0 out of the box. The Slate 8 has an 8 inch HD display with a 5MP rare camera and a 2MP front camera. The device is powered by MediaTek Quad Core processor and a 2GB RAM and has an internal storage capacity of 32 GB. It runs on Android 5.1 Lollipop and has a powerful 4500 mAh Lithium-Polymer. It has a 7-inch screen with a 5 MP primary camera and 2MP secondary camera. The device has a processing speed of 1.3 GHz and 1GB RAM and 8GB ROM which can be expanded up to 32 GB. It runs on Android Marshmallow and has a 3000mAh battery. Slice 3G has a 7 inch wide HD display with a 2MP rare camera and a 0.3 MP front camera. The device is powered with a 1.3 GHz dual-core processor and has 512 MB of RAM and 4GB ROM. It runs on Android KitKat out of the box and has a 3000mAh battery. It has a wide 10.1 inch IPS screen with Intel Atom Quad Core Processor. It has a RAM of 2GB and a ROM of 32 GB. It has a 5MP rear camera and a 2 MP front camera and also a massive 7000mAh battery. The device runs on Windows 8.1 out of the box. All of these devices are great but they all are priced above Rs. 6000, if you wish to get your hands on these devices at lower prices in India then the only place to visit is budli.in. Budli is the only site where you can get good quality refurbished electronics at cheaper prices. They have a wide range of products to offer amazing discounts. If you decide on buying electronics, visit budli.in to make a smart buy.